Sue Hendry Accredited BE u18 national coach and a PC eventing specific coach is offering limited places to her pace training and cross country clinic at Lindores Equestrian, Fife on Tuesday 17th July 2018. Sue will be one of the first instructors running a clinic using the innovative Lindores Optimum Time Trial. 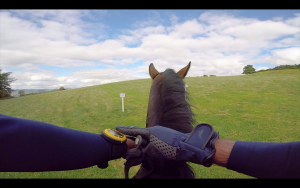 Designed to help riders broaden their understanding how pace is affected by: fences, fitness and different terrain. After approximately 45 minutes of pace work she will then be coaching you for a further 45mins on technical challenges throughout the cross country course. Ideal for riders and horses competing at Pony Club and British Eventing 80, 90 and 100cm. British Eventing rules allow BE80 riders and above to wear a watch in competitions so Optimum Time watches area available to hire on the day for £5. Lindores have also introduced new fence profiles and lines for 2018 season so take this chance to learn the right approach and style on good ground, with Scotland’s highly qualified and experienced instructor Sue Hendry. Times announced in advance but please let Sue know if you would like an afternoon or evening slot. The training can continue to 9pm due to the lighter nights in June.